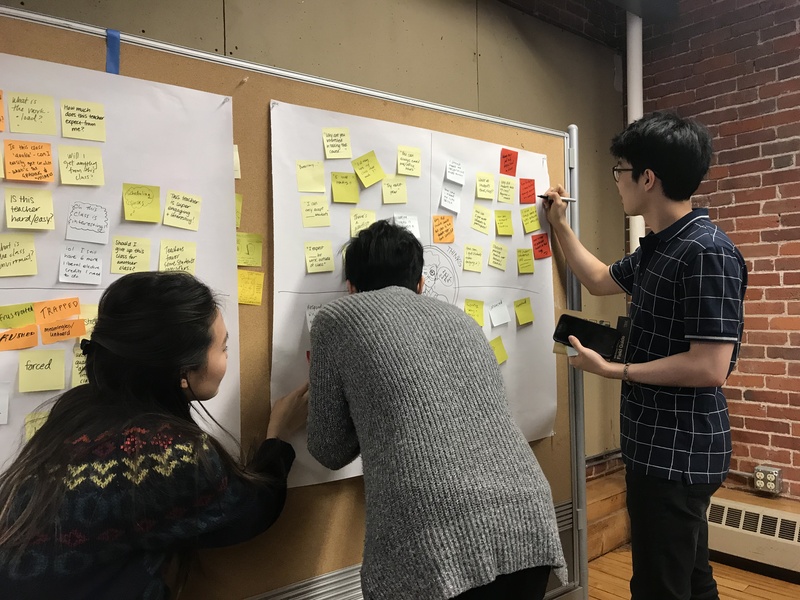 Students in an IBM-sponsored Wintersession studio incorporated extensive user research in proposing improved systems design for basic needs at RISD. For Industrial Design grad students Erica Efstratoudakis MID 18 and Katie Smiley MID 18, creating better systems for everyday life is complicated because, well, the people who use and rely on these systems are complicated. Even in the age of big data, humans are far too idiosyncratic in how and why they use things—and in how they feel about doing so—to let numbers and abstract models alone drive design thinking. “If we don’t design for [people’s] needs, we create systems that don’t work,” says Smiley, who collaborated with Efstratoudakis in leading Designing with Emotional Intelligence, a Wintersession studio focused on how to use qualitative research in making truly user-friendly products and platforms. 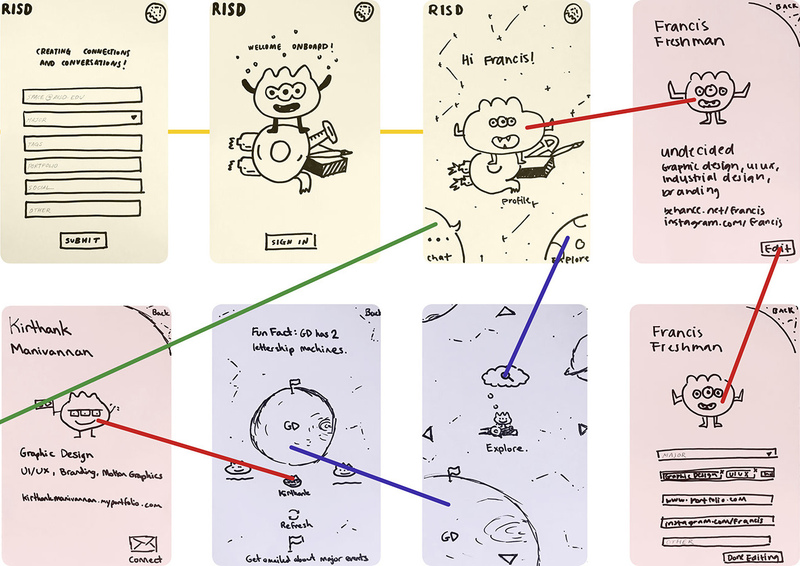 Through a partnership with IBM, students in the five-week course explored the emotional and intuitive aspects of practice that help designers be more effective advocates for end-users. Designing with emotional intelligence, says Efstratoudakis, is about putting “feelings and psyches and things that aren’t quantifiable” at the center of the process. To accomplish this, small teams of students looked at various RISD systems—from course registration to selecting on-campus housing—that frustrate the campus community and then proposed intriguing, human-centered improvements. As part of its support for the course, IBM introduced students to the tools, methods and best practices that drive the company’s approach to design thinking. Representatives from the global technology leader—including several recent RISD graduates—spoke to students about how to apply studio learning to projects of the scale and scope typical for IBM creative teams. Ivy Lim 18 GD, one of many Graphic Design majors to participate in the studio, appreciates the advice she received from the “wonderful IBM designers” about qualitative research and professional development, as well as the insightful feedback they provided during crits. “I learned how to use visual storytelling [techniques] to persuasively communicate projects to designers and non-designers,” says Lim, whose group created #HelpLarry, a hypothetical portal for selecting on-campus housing at RISD. 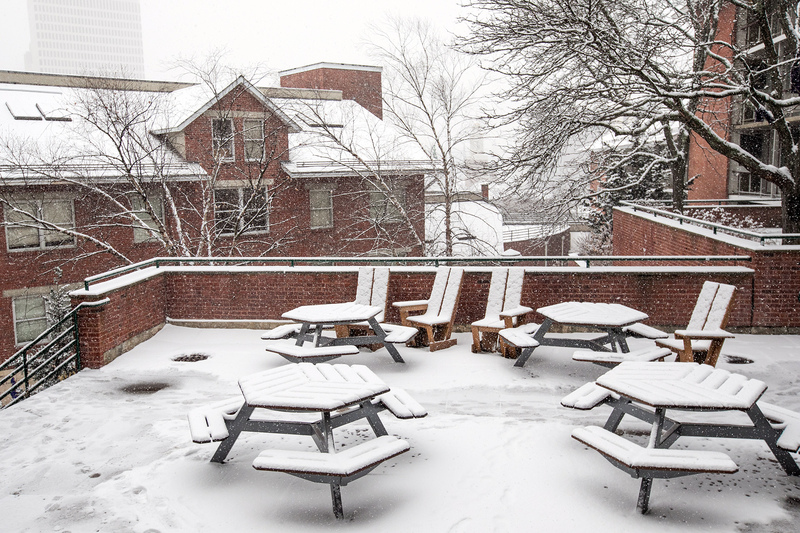 As part of their research, the team conducted interviews with students, resident advisors and Residence Life staff members to help understand the sources of frustration for everyone involved. Both instructors agree that the work students created for the course—from initial concept to execution—exceeded their high expectations. They also admit that they learned a lot along the way. “[During student presentations], Erica and I kept whispering to one another, ‘we should do this in our own work,’” says Smiley. In developing RISD Space, a tool for selecting a course of study that facilitates informative interactions between first-year students and those at various stages in a major, Kirthank Manivannan 18 GD says he and his team learned the value of “taking small steps and creating [connections] that can inspire change at a larger scale.” It’s a sentiment that Efstratoudakis and Smiley echo through their work (which focuses on human-centered improvements to women’s professional attire and public restrooms, respectively) and their core beliefs about design. As the keynote speaker at DESIGN WEEK RI, Anthony Pannozzo 91 ID offers an inspiring talk about the future of design. At the end of March, hundreds of design students and professionals converged on campus for the Industrial Design Society of America's 2017 northeast regional conference. In an interdisciplinary Wintersession studio, students transform architectural glass and mirrors into visually arresting sculptural work.